There were several college basketball coaches in attendance on Tuesday at the Muskegon- Mona Shores varsity basketball game. 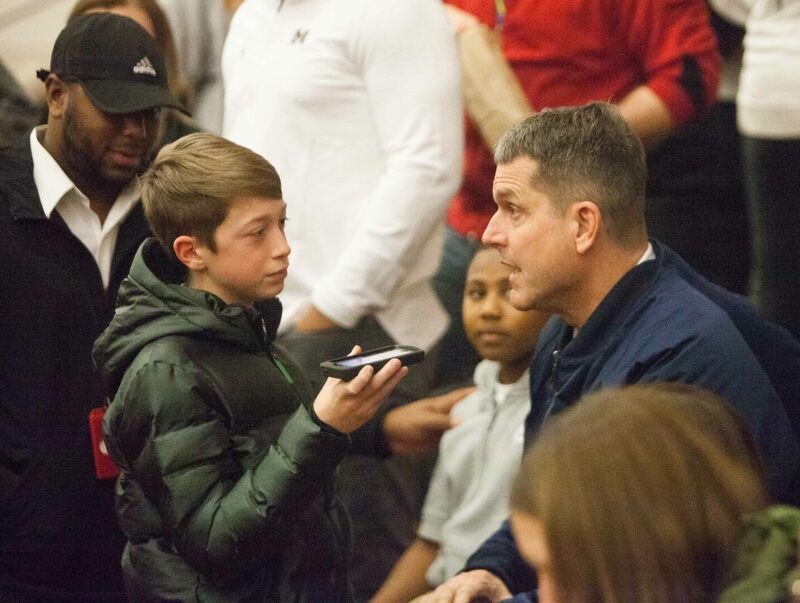 But it was a college football coach who caught the attention of several fans at Redmond-Potter Gymnasium. 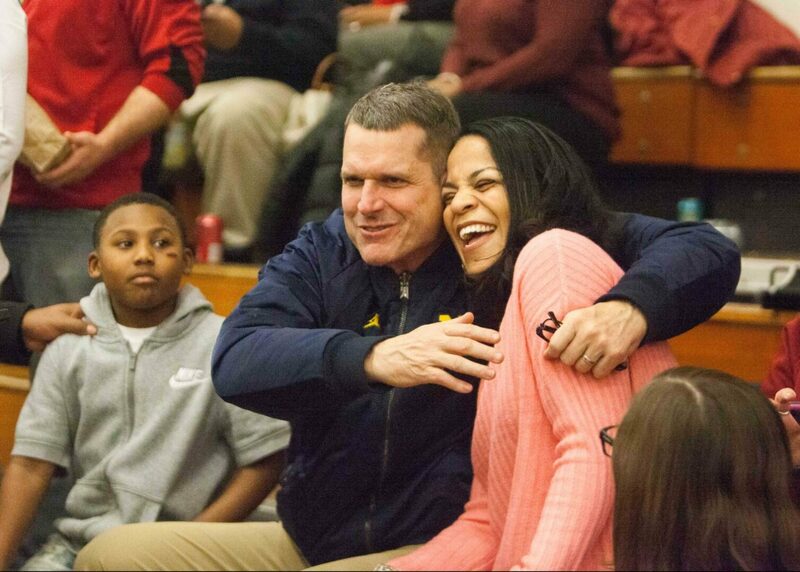 University of Michigan coach Jim Harbaugh entered the gym in the second quarter and was instantly mobbed by spectators looking to get a photo or autograph. 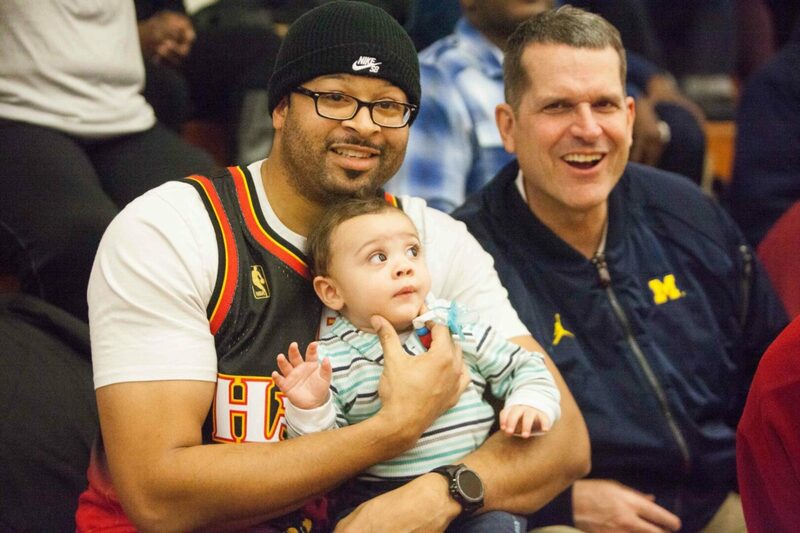 Although he couldn’t comment specifically due to NCAA rules, Harbaugh was very likely in attendance to catch a glimpse at a pair of Big Red basketball players that he would like to recruit for the Michigan football squad. He was accompanied by his brand new offensive coordinator, Josh Gattis. Michigan already offered a scholarship to junior quarterback Cameron Martinez on Nov. 11, but the Wolverines could be close to also extending an offer to junior Billie Roberts, a defensive end who recently was offered a scholarship by Michigan State. Harbaugh said he typically tries to get to a handful of games across the state to watch potential recruits. Martinez, who is considered a four-star recruit in the 2020 class, is likely being considered for several different positions at the college level. Most talent evaluators have the 5-11, 185-pounder pegged as a slot receiver or safety. In his first season as Muskegon’s quarterback after transferring from Muskegon Catholic Central, Martinez turned in a dominating season, rushing 222 times for 2,316 yards and 36 touchdowns. His yardage and touchdown totals were both single-season records at Muskegon.